November 8, 2010 - Most people are familiar with the cliché "too much of a good thing," but there is no such thing as excess when it comes to checking aircraft tire pressure. Aviation tires' design and construction differ from automobile tires, and though it is important to maintain the correct pressure in car tires, proper aircraft tire pressure is the most important factor in aircraft preventive maintenance. As a result, pilots and maintenance personnel must resist the temptation to follow the same schedule they would use in checking their cars' tires to determine that their aircraft tire pressure is correct. That's the advice from Goodyear Aviation's Robert Robson. He is Goodyear's Product Support Manager and regularly teaches aviation industry authorized inspection classes. Robson brings 10 years of aviation tire experience to the table, and his counsel is widely respected. 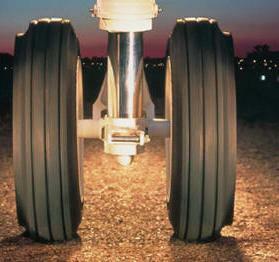 "Aircraft tire pressure should never be taken for granted," Robson said. "High pressures, high loads, and the different designs of aircraft tires and wheels often cause assemblies to lose pressure faster than those for cars." He said problems caused by incorrect aircraft tire pressure can be serious. Overinflated tires can suffer uneven tread wear, reduced braking traction, increased susceptibility to cutting, in addition to causing greater stress on wheels and landing gear. Underinflated tires also can wear unevenly and will experience increased stress and flex heating, which shortens tire life and can lead to tire failure. Robson advises daily aircraft tire pressure checks, preferably before first flight. "Check pressures when the tires are at ambient temperatures," he said. "Tire temperatures can increase 200°F during aircraft operation, and every increase of 5ºF results in approximately a 1% pressure change." Therefore aircraft tire pressure should never be reduced when the tires are still hot. Robson said tires should not be placed in service until they have been inflated for at least 12 hours after mounting. "All tires, particularly bias, grow after their initial mounting. The larger volume of the tire results in a pressure drop, and thus the tire must be checked and re-inflated if necessary," he said. After completing the 12-hour stretch, it is highly recommended to perform a 24-hour diffusion check to ensure the tire/wheel assembly is holding pressure within the limits of 5% per day, since there are numerous potential sources of pressure loss within the assembly. Both of these steps are important to help ensure the tires are not underinflated before entering service.